Despite a host of jokes about the kitchen being a woman’s place, when it comes to professional kitchens, food service is traditionally been a man’s domain. However, the number of females across the industry is on the rise, and Fine Food Australia is showing an ongoing commitment to supporting the women who make up all facets of food. Now in its second year, Fine Food Australia’s Women in Foodservice Charity Event will once again bring together leading women from across the industry for a morning of inspiration and networking. This year the guest speaker is the inspirational Anna Polyviou, Executive Pastry Chef of Shangri-La Sydney, and whose delicious carrot cake has reached iconic status thanks to her appearance on MasterChef. Anna will be joined on stage by Laura Neville and Joanna Savill, where the women will share anecdotes and insight from their time in the industry. In addition to the morning event, the women of the Australian food industry will be showcased across the floor of the 2015 event. One of the nation’s most recognizable female faces of food – and a total sweetie – the Queen of chocolate Kirsten Tibballs will be heading up the Bulla Pastry Stage, providing multiple opportunities across the four days to interact with, hear from, and be inspired by this incredible mentor. Much hard work goes on behind the scenes for the exhibitors of Fine Food Australia, and in addition to the ladies seen on stage, there are a host of amazing women bringing their products, expertise, and passion to this year’s show. One such lady is Catherine Bell, exhibiting her business Epicure Trading Ltd, which imports and distributes a range of ethical cookware and related products. Catherine is also founder of the Garden to Table Trust, has published two cookbooks, and was a finalist in the 2014 NEXT Woman of the Year awards. Another inspirational lady to look out for on the show floor is Jasmin Robertson, Director of Roza’s Gourmet Sauces. Taking over her family business after her mother’s passing, Jasmin has grown the company into a nationally recognized brand across industry and consumers alike, increasing revenue fourfold in just three years, and creating a must-have product for various allergy sufferers around the country. 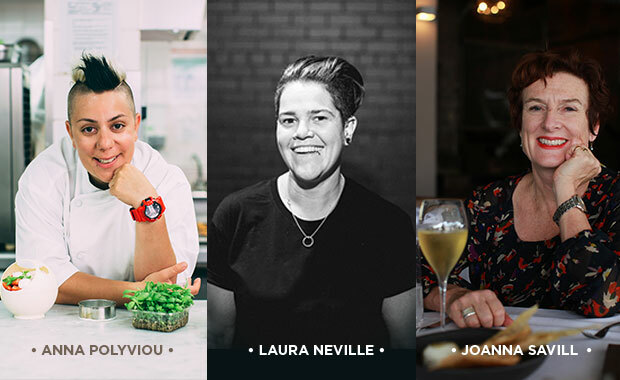 With the incredibly diverse but always inspiring women taking part in this year’s Fine Food Australia, one thing is for sure – sisters in the food industry are definitely doing it for themselves! Fine Food Australia is the country’s largest and most relevant food and hospitality event, showcasing everything from specialty and bulk foods, beverages, cooking and hospitality equipment and machinery, to bakery products, coffee and emerging food trends. The event offers one on one sessions with industry leaders, educational classes, demonstrations, and competitions, as well as the opportunity to build relationships, drive business, and be inspired about the industry. The Women in Food Service Charity Event will take place at the Nexus Room, Pullman Sydney Olympic Park, on Tuesday 22 September 2015 from 10:30am – 12:30pm. All profits after operating costs will be donated to OzHarvest and the P.A.R.T.Y Program. Registration: Register free online: www.finefoodaustralia.com.au. Fine Food Australia is strictly a trade only event. Children are not permitted. Gloria Jean’s Coffee is now selling a Macadamia and Rose flavoured beverage range.